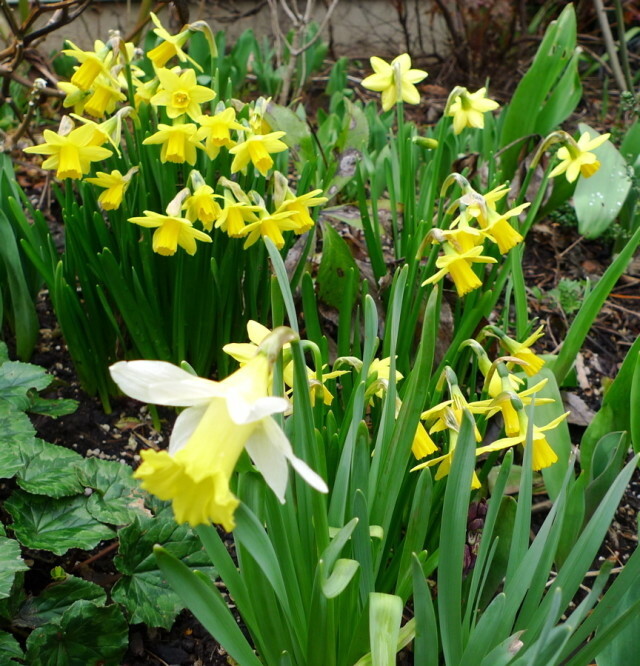 Justabout every retailer around town and on-line has now put spring bulbs on sale. Buy them right away and get them in the ground in the next week or so, and you will have gorgeous sheets of bulbs in flower in your spring garden. They will likely flower a bit later than normal, but who cares? The main trick to discount shopping for bulbs in November is to make sure you're still getting healthy bulbs. If you buy from a bulb specialist, you can expect that the bulbs have been stored properly in coolers. It's a little dicier to buy bulbs from your local retailers - most shops are heated, the bulbs have been sitting there since September, and sometimes they can begin molding or drying out. There isn't staff to go through every bulb box and pick out the mushy ones. That's your job. Be sure to check each bulb you buy. You want bulbs that feel heavy, solid and firm. Avoid any with blue mold, that are squishy or soft, or that are much smaller than the rest. (Sometimes they are broken pieces from another bulb and won't flower.) Note: sometimes tulips lose their papery sheathes - if the white bulb underneath is not damaged, it will usually flower normally. In addition to the usual daffodils, tulips and crocus, look for flowering onion (Allium) bulbs. These underutilized gems come in a variety of shades of purple, pink, silver, white and green and are highly architectural additions to the garden. They can be tiny little gems (like our native Allium cernuum) or spectacular, four foot tall globes of silvery purple that last for weeks and often look great and stand tall long after they've finished flowering. Also look for the Pacific Northwest native camas (Camassia). This iconic flower looks great in sheets, and is perfect for damp areas of the garden. Best deals can be found at your local nurseries (often up to 50% off). The sooner you buy, the better chance you have of getting desirable varieties and the quantities you may want. There are also a 40% off sale at Van Engelen Bulbs (40% off) and weekly specials at Brent & Becky's Bulbs (this week, it's on tender indoor bulbs for the holidays, like Freesia, amaryllis and paperwhite Narcissus). Have fun and get busy! You'll be glad you did it in the springtime, when those sunny daffodils and bright tulips are blooming.